A volcano used in the filming of The Lord of the Rings has erupted, spewing hot ash high into the atmosphere. Mount Tongariro has erupted in New Zealand, startling hikers and scientists alike. The volcano, and much of Tongariro national park, is famous for portraying the blasted landscape of Mordor in Peter Jackson's The Lord of the Rings movie trilogy. The scientists were caught by surprise because they were watching another nearby volcano for activity. The hikers were surprised because, according to local Clint Green, "all of a sudden a towering black plume just began erupting very quickly, skyrocketing up, at first I didn't believe what I was seeing." Among the surprised hikers were 90 schoolchildren, whose teachers caught the eruption on video. A spokesperson for GNS Science, the official monitoring organization, said "it was completely unexpected, there were no warning signs beforehand. We were watching Ruapehu waiting for an eruption and instead this came out of nowhere." Ruapehu, which was expected to erupt some time soon, is nearby - and is perhaps Mordor's more famous volcano. Ruapehu is Amon Amarth, Orodruin, also known as Mount Doom. 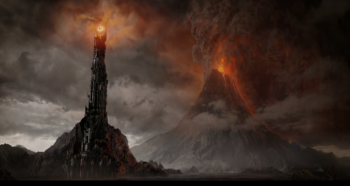 At least, it stood in for Mount Doom in The Lord of the Rings. Ruapehu has recently had a buildup of pressure in a subterranean vent. Tongariro erupted earlier this year, briefly, for the first time in a hundred years, but wasn't due to erupt again this year. GNS said it was impossible to know whether or not the buildup in Ruapehu and the eruption of Tongariro were linked. The ash cloud reportedly climbed about 4,000m into the air. Locals were told to expect light ashfall over the next few days, which should complete the illusion that they live in a grim, despairing land ruled by a dark lord.